A couple of weeks ago we wrote about Open Data Communities, the new DCLG linked open data site. The core function of the site is to give machine-readable open access to a selection of DCLG datasets to enable and encourage people to use that data. To help illustrate what kind of data visualisations are possible and demonstrate one approach to doing it, we built the Local Authority Dashboard. Either enter a postcode (in England, as the datasets only cover England) or choose a local authority from the list, and you get a page like this one, for Wandsworth Borough Council in London. It’s not intended to be a comprehensive portal. We’ve taken a subset of the datasets held in Open Data Communities (which is itself a small subset of the total collection of data published by DCLG), covering housing, finance, deprivation and geography. Then we’ve built some graphic illustrations of the data for the chosen authority and how that relates to other authorities across the country. 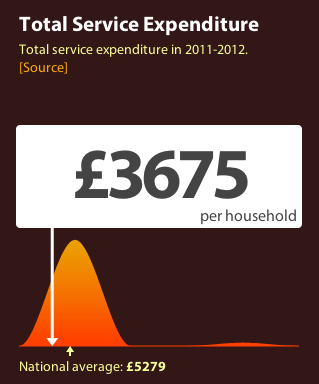 For example the image above shows that Wandsworth’s spend per household is below average for London Boroughs. The dashboard currently uses data just from Open Data Communities, but this approach is well suited to pulling data from multiple sources. So we hope that this example could be useful to people who want to gather and explore local data of all kinds. We’ll be writing more about the details of our approach over the coming weeks.